On arrival at Nairobi Airport, meet and greet service. Transfer to Nairobi Safari Club for the night on bed and breakfast. Depart Nairobi in the morning for Samburu National reserve crossing the Equator and driving through changing terrain to the rugged semi-desert region in the northern Kenya. Though harsh, it is blessed with species rarely found elsewhere. Arrive in time for lunch at lodge. Afternoon game drive to search for the stars of Samburu. Dinner and overnight at Samburu Lodge / Samburu Serena lodge, B,L,D. Full day in Samburu with game drives. Search for the rare liver red reticulated giraffe, Grevy's Zebra, Beisa Oryx, Blue flanked Somali Ostrich, Vulturine Guinea Fowl and long-necked Gerenuk. See braving lions on the grass, Cheetah, Leopards among plenty of other plains game. (Optional visit to a local Samburu village). All meals and overnight at Samburu Lodge / Samburu Serena lodge, B,L,D. Breakfast at a lodge and drive to the shoulders of Mt. Kenya arriving at the Outspan Golf & Country Club for lunch. After lunch transfer by lodge vehicle to the Treetops Lodge where from the lodge balcony you view game that often visit the floodlit waterhole and saltlick--e.g. elephants, rhino, buffalo and giant forest hog. Dinner and overnight at Treetops Lodge, B,L,D. Game viewing is very rewarding: lion. leopard, baboon, Black and White Colobus and Sykes monkeys are abundant. Rare sightings have also been made of the Golden Cat. Bird viewing is incredible with over 250 species recorded, including Jackson's Francolin, sparrow hawk, African goshawk, eagles, sunbirds and plovers. Depart Treetops lodge for breakfast at Outspan Golf & Country Club and depart for Lake Nakuru via Thompson falls arriving in time for lunch, afternoon game drive at the Pink lake referred so for it's thousands of pink flamingos and other bird-life-it's a Bird watchers paradise. It has a surprisingly number of animals; all the "big five" except the elephant can be seen here. Dinner and overnight at Lake Nakuru Lodge / Sarova Lion Hill, B,L,D. Lake Nakuru, a small (it varies from 5 to 30 square kilometers) shallow alkaline lake on the edge of the town of Nakuru lies about 160 kilometers north of Nairobi. It can therefore be visited in a day tour from the capital or more likely as part of a circuit taking in the Masai Mara or Lake Baringo and east to Samburu. The lake is world famous as the location of the greatest bird spectacle on earth - myriads of fuschia pink flamingoes whose numbers are legion, often more than a million maybe two. They feed on the abundant algae, which thrives in the warm waters. There are over 400 resident species on the lake and in the surrounding park. Thousands of both little grebes and white winged black terns are frequently seen as are stilts, avocets, ducks, and in the European winter the migrant waders. You will also see warthog, waterbuck and large numbers of impala; slightly shyer residents include buffalo, Rothschild giraffe, eland, the occasional leopard and both black and white rhino. A herd of hippo have their territory in the northern part of the lake. After breakfast depart for mainsail Mara via Narok Town arriving Maasai Mara in time for lunch. Afternoon game drive in search of the high concentration of animals to include big five and other plain�s game. Dinner and overnight at a lodge, Mara Simba Lodge or Keekorok Lodge or Mara Serena Lodge, B,L,D. With its rolling grasslands and wide-open savannah, the Masai Mara is the kind of unfettered, sprawling wilderness you will have discovered in Hollywood films set in Africa. Kenya's finest reserve, the Masai Mara pulses with raw energy as an array of animals go about their daily lives. At certain times of the year the famous Mara throbs to the beat of hundreds of thousands of hooves as the Great Wildebeest Migration takes place. The reserve is unfenced and borders the Serengeti National Park. The two countries share the vast Serengeti plains, with the wildlife free to roam between Kenya and Tanzania in search of food. The Masai Mara Reserve is rich in Africa's biggest attractions - predators are abundant (lion sightings are incredibly common), and the Big Five are encountered around every corner. The Mara is a permanent water source for the area's wild inhabitants and so even when the very last wildebeest has tardily set off for the southern Serengeti, massive resident herds remain, offering visitors everything they could want to see on an African safari. A Masai Mara safari provides a year-round safari experience. The accommodation in the Masai Mara is as varied and rich as the wildlife experience that awaits you. From large lodges to exclusive tented camps, your stay will be made that much more special by the people that welcome you here. Try a Masai Mara safari tour to experience the best of the Mara. There's the focused Lake Nakuru and Masai Mara safari or, if time is on your side, the Northern Kenya and Masai Mara Fly-In Safari will provide you with a more in-depth experience. Full day in Maasai Mara with morning and afternoon game drives. Dinner and overnight at Mara Simba Lodge or Keekorok Lodge or Mara Serena Lodge, B,L,D. After breakfast depart Maasai Mara for Amboseli stopping in Nairobi for lunch. Afternoon proceed to Amboseli arriving early evening. Dinner and overnight at Amboseli Serena Lodge, B,L,D. Amboseli is a top destination for a Kenya Safari. Indeed, one of the classic images of East Africa, let alone Kenya, is that of a herd of elephants strolling across the plains with the snow-capped peak of Kilimanjaro in the background. It is to catch this sight on memory - and on film - that people flood to Amboseli National Park. While Kilimanjaro is actually across the border in Tanzania, Amboseli has a perfect view of this world's tallest freestanding mountain, rising an impressive 5 kilometers above the plains. The best time to view the majestic mountain is at dawn and sunset, when the clouds lift and the light is both clear and soft. Amboseli is about 200km from Nairobi on fairly good roads, and the usual route is via Namanga on the A104. The last 70km from Namanga is a bit bumpy so be prepared. Air Kenya also offers daily flights to the reserve. It's also a park that combines well with Tsavo National Park to the east, or Tanzania's Kilimanjaro and Arusha National Parks. The park is one of the smaller game parks in Kenya, but it offers you the best opportunity of seeing the critically endangered black rhino, along with a spectacular range of wildlife. The area's low and well-munched vegetation also ensures that animals are easy to spot. Lions can easily be found and can occasionally be watched stalking their prey. Buffalo, cheetah, gazelle, hyena, jackal, wildebeest, zebra, and baboon are just some of the animals that can be encountered at Amboseli. Full day in Amboseli with morning and afternoon game drives. All meals and overnight at Amboseli Serena Lodge, B,L,D. After breakfast leave for Namanga border from where you will undergo immigration and customs clearance. Proceed to Arusha arriving for lunch at Arusha Hotel. Afternoon depart to the incredible Ngorongoro Crater arriving early evening. Dinner and overnight stay at Ngorongoro Serena Lodge or Ngorongoro Sopa Lodge, B,L,D. Ngorongoro Crater is an extinct volcano that collapsed around 25 million years ago thus forming a vast super bowl where the largest permanent concentration of African game is on display. The views from the top of the crater wall are absolutely breathtaking which are forested but four wheel drive vehicles will take you down into this primeval paradise of woodland, lake, river, swamp and plain that shelters around 20,000 animals. Large grazing animals such as wildebeest, buffalo, gazelle and zebra that depends on the open grasslands in the crater. Attracting predators, the black-maned lion, the leopard and hyena. 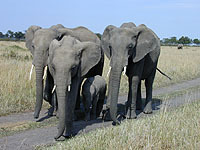 The elephant found are the lone males. The Fever Tree forests shelter monkeys, bushbuck and waterbuck and the few black rhino that have taken refuge here. A soda lake attracts water birds, including flamingoes and is a favourite place for predators to make their kill. Wildly beautiful as it is, it is not surprising that Ngorongoro Crater has been called a Garden of Eden. After breakfast, depart with picnic lunch boxes for a full day crater tour and game drives. Returning to the lodge in the evening for dinner and overnight, Ngorongoro Serena Lodge or Ngorongoro Sopa Lodge, B,L,D. Depart Ngorongoro after breakfast via Olduvai Gorge to Serengeti arriving in the afternoon, enroute game drive to the lodge. Dinner and overnight at Serengeti Serena Lodge or Serengeti Sopa Lodge, B,L,D. Tanzania's oldest and most popular national park, the Serengeti is famed for its annual migration, when some six million hooves pound the open plains, as more than 200,000 zebra and 300,000 Thomson's gazelle join the wildebeest�s trek for fresh grazing. Yet even when the migration is quiet, the Serengeti offers arguably the most scintillating game-viewing in Africa: great herds of buffalo, smaller groups of elephant and giraffe, and thousands upon thousands of eland, topi, kongoni, impala and Grant�s gazelle. The spectacle of predator versus prey dominates Tanzania�s greatest park. Golden-maned lion prides feast on the abundance of plain grazers. Solitary leopards haunt the acacia trees lining the Seronera River, while a high density of cheetahs prowls the southeastern plains. Almost uniquely, all three African jackal species occur here, alongside the spotted hyena and a host of more elusive small predators, ranging from the insectivorous aardwolf to the beautiful serval cat. But there is more to Serengeti than large mammals. Gaudy agama lizards and rock hyraxes scuffle around the surfaces of the park�s isolated granite koppies. A full 100 varieties of dung beetle have been recorded, as have 500-plus bird species, ranging from the outsized ostrich and bizarre secretary bird of the open grassland, to the black eagles that soar effortlessly above the Lobo Hills. Full day in Serengeti with morning and afternoon game drive. All meals and overnight at Serengeti Serena Lodge or Serengeti Sopa Lodge, B,L,D. Lake Manyara National Park is one of the smallest but most ecologically diverse game reserves in Tanzania. Two thirds of its 330km2 are made up of the water of Lake Manyara, but the remaining third contains an astonishing range of habitats. 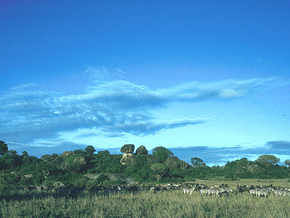 The grassy floodplain that surrounds the lake becomes dense acacia woodland, which in turn gives way to the rocky base of the Tanzanian escarpment. There is also a section of groundwater forest near the gate. Each habitat offers its own range of game viewing options. The lions in Manyara are famous for climbing trees - unique behavior for their species. You'll need to be a little lucky to see them though, so don't be disappointed if they elude you. The great diversity of habitats at Lake Manyara National Park also makes it a superb birding destination. More than 380 species have been recorded, and the lake is especially known for waterfowl and migrants. After breakfast at Lake Manyara, drive to Arusha arriving for lunch and last minute souvenir shopping. At 2pm, take a road transfer to Nairobi Airport arriving at approximately 1900hours where you will connect with your flight back home. End of tour services, B,L. During April 1 - May 31: US$ 4450 per person sharing. -Start and end in Arusha.